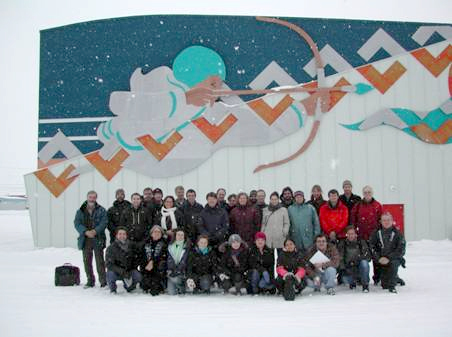 The first Regional Science Meeting/Workshop held in Kuujjuaq from 10-12 November 2009 was an excellent occasion to reunite partners of this region around a common goal. The main objective of the workshop was to bring together scientists, managers, decision and policy makers from both Nunatsiavut and Nunavik (Figure 2) to discuss the content of the IRIS report in order to ensure the best coverage of priority issues across the two regions and to provide insight into the assessment report. This successful meeting/workshop has led to the creation of the IRIS 4 Steering Committee whose role is to provide guidance to the authors to ensure that the format and content will be relevant to decision makers and stakeholders of the region. Since the Kuujjuaq meeting, the report’s Table of contents has been improved and organized according to the priority issues identified for Nunatsiavut and Nunavik. These issues are human health, safety and security, vulnerability of infrastructures, resource exploitation and socio-economic development. The breadth of topics covered by the natural, social and health scientists ranges from the consequences of thawing and erosion of permafrost, to the shifts in the diversity of food supplies from hunting to cultural self-determination in the face of environmental change and modernization. The assessment report will consist of a public report containing relevant science on key issues presented in an accessible format and style. The key findings and conclusions will convey a synthesized vision of the impacts of climate change and modernization while providing local communities with knowledge leading to affordable strategies that respect Inuit perspectives and interests.